LADDER 106	BROOKLYN ORGANIZED LADDER 6, BROOKLYN FIRE DEPT. CONIPANIES OF THE TENTH  DISTRICT. young and powerful specimens of fire horses. The company on a first-alarm respond to calls from 48 boxes and on a second-alarm to 45 additional. East River and Newtown Creek. works and MeCaifrey & Jacob's varnish works. 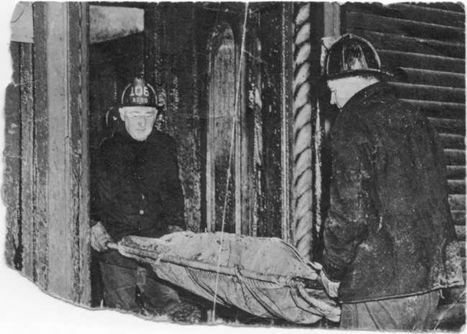 burned up, and several firemen had a narrow escape from being crushed by falling walls. body and bruised on the back and legs by falling walls, that he was laid up for nearly six months Mr. Allen is a bachelor and lives at No.638 Leonard Street. Assistant Foreman FRANCIS C. SPILLANE was born in New York City, on Sept. 9, 1861. He is a bachelor and resides at No.308 Lorimer Street. has since remained. He was made an Assistant Foreman on July 1, 1889. CORNELIUS CUNNINGHAM was born at Lyons Falls, Lewis County  NY, on September 15, (1856). life-savers. On Oct. 23, 1888, a fire occurred at No. three-story and attic building. In the attic lived John Gravesmuller, who had but one leg. 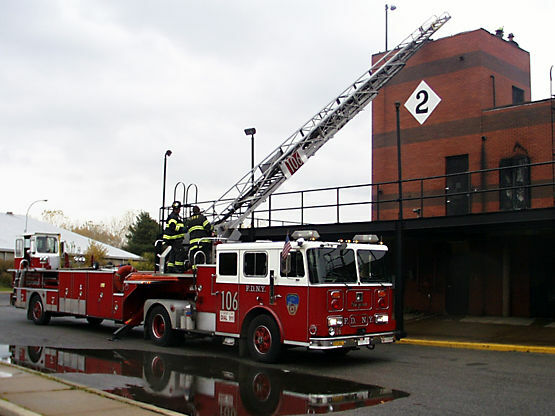 years in the United States Navy, and in the Volunteer Department days was attached to Ridgewood Hose No.7. at the Bell tower. He was born in Ireland, Dec. 12, 1859, and was appointed to the force Mr. Reardon is married and lives at No.526 Lorimer Street. volunteer days he ran with Engine Company No. r.
to that time he ran with with Ridgewood Hose No.7. He is married and lives at No.123 Greenpoint Avenue. 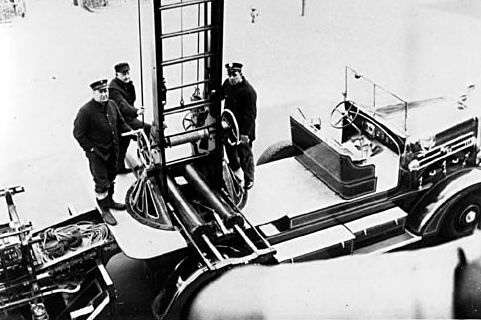 JOHN F. MAHER was born in the County Tipperrary, in 1867, and became a fireman on March 12, 1891. He lives at No.571 Driggs Avenue. face at a fire at the foot of Manhattan Avenue, a few years ago. He lives with his family, at No. 382 Leonard Street. EUGENE J. MCKENNA was born in New York City on Oct. 16, 1865, and was appointed to the uniformed force on Nov. 15, 1891. 1882. He is a widower and lives at No.199 Green Street. 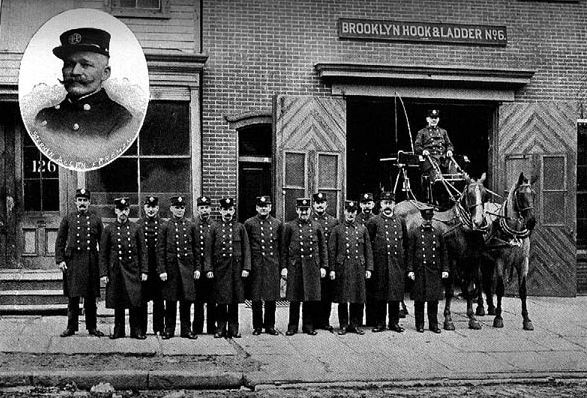 MICHAEL O'KEEFE was born in New York City, July 14, 1855, and on Jan.31, 1882, became a fireman. At the fire at Pratt's oil works, on Oct. 18, 1888, he was severely burned about the face and hands. Mr. O'Keefe is married and lives at No.138 North Eighth Street.